Proposed plans for Wyndham Park's new buildings and features. View our proposed plans for the parks Heritage Lottery Fund (HLF) and BIG Lottery Funded restoration project. The Heritage Lottery Fund (HLF) and BIG Lottery Funded project will include plans for renovation of the old swimming pool ticket office, the creation of a community focused visitors' centre, the relining and filling of the boating lake and new soft landscaping work. All of the plans can be viewed online until April 28. The park was awarded funding of £818,000 from the HLF and the Big Lottery Fund last July to restore it as a First World War memorial park and initial works are set to begin this September. 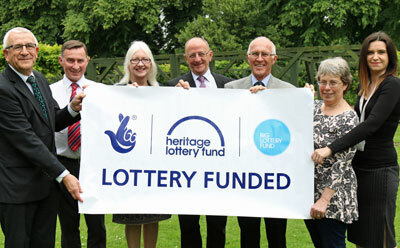 SKDC and Grantham’s Wyndham Park Forum have received grant funding of £818,000 from the Heritage Lottery Fund (HLF) and the Big Lottery Fund to finalise major plans to refurbish the park’s grounds and buildings. A project will now aim to restore the park to its former glory as a First World War memorial park and build on its reputation as one of the district’s finest assets. Development funding of £92,500 was awarded in 2014 to help the Forum and the Council progress their plans to apply for the full grant and will enable new and improved features and buildings based around the park’s heritage. Chairman of Wyndham Park Forum, John Knowles said: “This is great reward for the time volunteers and officials have put into this effort that will truly transform parts of the park. The funding for Wyndham Park comes as part of an announcement of £30.7million for 16 parks across the UK. HLF’s Chair Sir Peter Luff, said, on behalf of HLF and Big Lottery Fund: “It’s clear that our parks are important to us in countless ways – from physical and mental wellbeing to a connection with nature and our heritage. It’s also clear however that public parks must work in new ways to respond to the funding challenges they face and this investment, thanks to National Lottery players, will help them to do this. To celebrate the funding decision, the Council have launched a new website for the park www.wyndhamparkgrantham.co.uk and new social media channels on Facebook and Instagram.